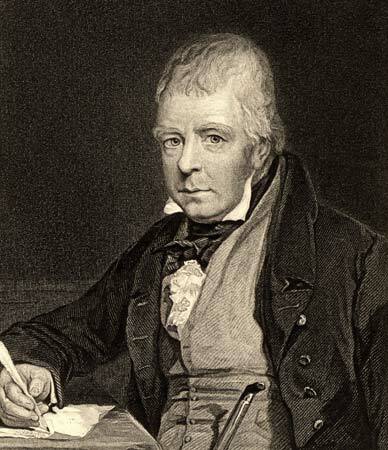 Sir Walter Scott, 1st Baronet http://www.britannica. In Ivanhoe, Scott addresses what he purports to be the beginnings of the “English identity” with the portrayal of the barriers between the Norman lords and their Saxon serfs. Scott creates “history” with his scenes demonstrating the divide between these two groups: politically, culturally, and linguistically. These depictions influenced later historiography. For a discussion of whether this “creation of history” was a good or a bad thing, read The Isles: A History, by Norman Davies (Macmilliam Press, 2000, pp. 335-337). Scott’s story brings to life the hardships under which the Saxons lived. Ivanhoe is set four generations after the Norman conquest of England. Having been captured on his return to England after the Crusades, King Richard is an Austrian prison. His brother, Prince John, has claimed the throne. Prince John encourages the Norman nobles to claim supremacy over the Saxons, capriciously robbing the Saxons of their lands and turning Saxon landowners into serfs. The Saxon nobility, especially Cedric of Rotherwood, decry the Norman’s highhandedness. Cedric is so loyal to the Saxon cause that he has disinherited his son Ivanhoe for following King Richard to war. The epigraph for Chapter 7 comes from John Dryden’s poem “Palamon and Arcite.” This poem is based on Geoffrey Chaucer’s “Knight’s Tale,” one of the Canterbury Tales. In these particular lines, we get a description of knights coming together for a tournament. A third the shining buckler did advance. And snorting foam’d and champ’d the golden bit. And nails for loosen’d spears, and thongs for shields provide. And clowns come crowding on, with cudgels in their hands. The condition of the English nation was at this time sufficiently miserable. King Richard was absent a prisoner, and in the power of the perfidious and cruel Duke of Austria. Even the very place of his captivity was uncertain, and his fate but very imperfectly known to the generality of his subjects, who were, in the meantime, a prey to every species of subaltern oppression. Prince John, in league with Philip of France, Coeur-de-Lion’s mortal enemy, was using every species of influence with the Duke of Austria, to prolong the captivity of his brother Richard, to whom he stood indebted for so many favours. In the meantime, he was strengthening his own faction in the kingdom, of which he proposed to dispute the succession, in case of the King’s death, with the legitimate heir, Arthur Duke of Brittany, son of Geoffrey Plantagenet, the elder brother of John. This usurpation, it is well known, he afterwards effected. His own character being light, profligate, and perfidious, John easily attached to his person and faction, not only all who had reason to dread the resentment of Richard for criminal proceedings during his absence, but also the numerous class of “lawless resolutes,” whom the crusades had turned back on their country, accomplished in the vices of the East, impoverished in substance, and hardened in character, and who placed their hopes of harvest in civil commotion. To these causes of public distress and apprehension, must be added, the multitude of outlaws, who, driven to despair by the oppression of the feudal nobility, and the severe exercise of the forest laws, banded together in large gangs, and, keeping possession of the forests and the wastes, set at defiance the justice and magistracy of the country. The nobles themselves, each fortified within his own castle, and playing the petty sovereign over his own dominions, were the leaders of bands scarce less lawless and oppressive than those of the avowed depredators. To maintain these retainers, and to support the extravagance and magnificence which their pride induced them to affect, the nobility borrowed sums of money from the Jews at the most usurious interest, which gnawed into their estates like consuming cankers, scarce to be cured unless when circumstances gave them an opportunity of getting free, by exercising upon their creditors some act of unprincipled violence. Under the various burdens imposed by this unhappy state of affairs, the people of England suffered deeply for the present, and had yet more dreadful cause to fear for the future. To augment their misery, a contagious disorder of a dangerous nature spread through the land; and, rendered more virulent by the uncleanness, the indifferent food, and the wretched lodging of the lower classes, swept off many whose fate the survivors were tempted to envy, as exempting them from the evils which were to come. 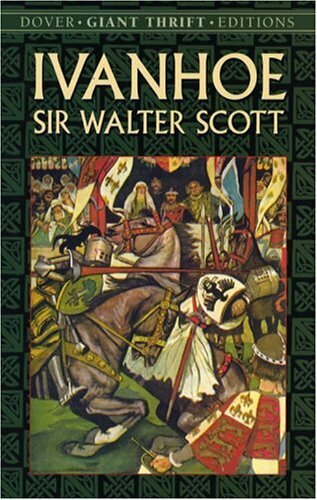 Parrinder says, “In Ivanhoe the King whose banner of Le Noir Faineant, literally, the ‘do-nothing’ black knight – [represents] a medieval anticipation of the nineteenth century doctrine of laissez-faire (155).” Scott’s story creates a crisis of instability and anarchy as the setting. Much of the derision between the Normans and the Saxons occupies the opening chapters of the novel. The “contagious disorder” in the quote above is the suffering of ordinary people. This “epic” romance is what Scott called the “Big Bow-Wow strain.” In Part II, we will look at the “romance” found in Scott’s Ivanhoe. This entry was posted in Anglo-Saxons, British history, Great Britain and tagged Historical Romance, Ivanhoe, Sir Walter Scott. Bookmark the permalink. Fascinating! I look forward to Part 2. I decided for my New Years’ resolution to use a bit from my multiple higher education degrees. LOL! I am pleased you found this useful. He’s one of my favorite authors, Regina. So glad you are featuring him! Scott makes a VERY brief appearance in one of my upcoming releases, Laurie.